Hey everyone! I know it’s been ages since I’ve updated. Been rather busy what with the start of the second semester, going back to uni, searching for cheap second-hand books, and all the other boring stuff you do when you resume classes. Also been on a TVB-watching spree – finished off Heart of Greed, To Grow With Love and Devil’s Disciples. I have a lot of comments on all three shows, as I always do, and will do a full write-up, hopefully sometime soon. Cast: Lee Sze Kei, Ha Yu, Susanna Kwan, Michelle Yim, Moses Chan, Linda Chung, Bosco Wong, Tavia Yeung, Louis Yuen, Raymond Lam, Yoyo Mung, Chris Lai, Fala Chen, Carrie Lam, and the list goes on. But just briefly, a few words on all three series. Heart of Greed started out so strongly, and maintained that throughout the series, but for me, failed at the final hurdle. Sadly. I didn’t feel fulfilled with the final episode, for some reason or another. Maybe because it felt like I was promised a better ending than the one we were given. That aside, I really did love the entire cast. The veterans delivered stellar performances, and I believe “Dak Dak Dei” will put Moses amongst the front-runners for Best Actor at this year’s TVB Anniversary Awards. To Grow With Love had so much potential, I thought. Myolie was really adorable with the weight she gained. It started off rather funny, but midway, it crashed and burned for me. It started grating on my nerves and instead of having heart and humour, it got nonsensical and pointless at times. I ended up watching to the end, only because I can’t stand not finishing a series I start (oh, if only I felt the same way about homework, heh) and only for the supporting characters, i.e. Jack Wu and Selena Li‘s characters. I quite liked the costumes in this series, maybe it’s because I haven’t seen an ancient series in almost forever. Although, I can’t understand why all the guys don’t have the typical long plait that men are depicted to have back then. As for Devil’s Disciples, I really didn’t think it was as bad as a lot of the people on various chatboxes around the TVB blogging world said it was. I might have had it a lot easier than they had since I was already a fan of Bosco and Bernice individually to begin with. Bosco was a lot more at ease with the happy-go-lucky, simple character compared to his role in HOG, and I enjoyed Bernice as the strong ‘tai si jeh‘. Sharon Chan was surprisingly more convincing than I thought she would’ve been. Wayne Lai proves again that he can do no wrong, unlike the ending of the series, which frustrated me. The song and dance routine, while hilarious, was absolutely pointless. The Drive of Life has been raking in high ratings for its debut, and the released pictures of Michael and Sheren’s relationship make me want to watch it straight away. Anyone seen it? If so, what do you think? 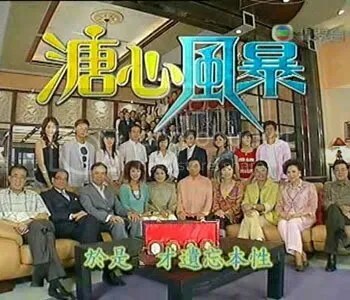 ← The Tangled Web of TVB; #1.
mc3: Well, I liked the ending of the series, as in it was a happy ending, the people got their just desserts, but it felt rather rushed at times, and just wasn’t solid enough to close off the series, I thought. But other than that, I loved HOG. Definitely one of my favourites thus far.As for TGWL, yeah it was pretty funny at times, but the times when it was not being funny, it was being kinda annoying, lol. But yeah, I watched it to pass time too.Yeah I know the feeling for DD. It surprised me that I kinda enjoyed watching it because I don’t usually like wuxia series all that much. But there’s just something that didn’t feel right; I think it was the ending for me (Haha, now I probably seem like I’m so picky with endings). I liked the cast, except for Kevin because he really doesn’t make me feel much. Bosco and Wayne, and Johnson Lee were hilarious! mc3: Oh yeah, that is probably one of my reasons. I’ve never found him to be a particularly adept actor. But then again, that’s just me.ktvb: I hope I won’t procrastinate and have them up soon instead. 😀 I don’t know how you manage to update so regularly with reviews, honestly. Bravo! mc3: I had better too! There are plenty of Kevin fans out there, I think. I do enjoy him in scenes with certain co-stars, however. I really liked him with Niki, and also with Sharon in DD.